As this is the type of isomerism which can be found in thalidomide, it is of special interest to us here. With optical isomerism, there is no difference in connectivity and no double bonds. The isomerism is to do with the arrangement of the atoms in space. It arises through the presence of a Chiral Centre. Optical isomers are Non Superimposable Mirror Images of each other; a set of optical isomers are called enantiomers. Enantiomers can not be interconverted without breaking bonds. They have mostly identical physical properties and can often only be told apart by what we call Optical Activity. This is the observation that in a pair of enantiomers one will rotate plane polarised light clockwise, and the other an equal amount anticlockwise. The Chiral Centre is an atom connected to Four Different Subsituent Groups. If there is one chiral atom in a molecule there will be two enantiomeric forms. A molecule with two chiral centres however need not be Chiral! Organic compounds give endless examples of chirality. 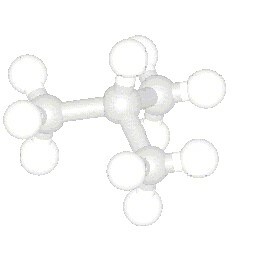 Here, I have pictured 1,1-chlorofluoroethane (an example of a CFC). Carbon1 has a hydrogen, a chlorine, a fluorine and a methyl group attached to it making it a chiral centre. It therefore exists in these two enantiomeric forms. The two molecules cannot be superimposed on one another. This image (right) better shows the non superimposable nature of the object and image. Two of the groups are in line, however, the other two have the wrong orientation. Click on either image for the 3D molfiles. We need an unambiguous method for assigning absolute configuration to a chiral centre. There are a few simple steps which allow us to assign either 'R' or 'S' configuration to chiral atoms. These configurations are then included in the name to enable differentiation. Firstly we again need to assign priority to the subsituents. We use the same rules as before, and assign priority to all the groups attached to the chiral atom. Now we look at the molecule from the direction which puts the lowest priority group (often hydrogen), in line with, and behind, the chiral atom. Group 4 has been enlarged so it can be seen behind the chiral atom. If the priority order of the groups (1-2-3) is now clockwise the molecule is named as the 'R' isomer. If the priority order of the groups (1-2-3) is anti-clockwise the molecule is named as the 'S' isomer. Here the order is clockwise and so the isomer would be named 'R'. See The Thalidomide page for a further example.